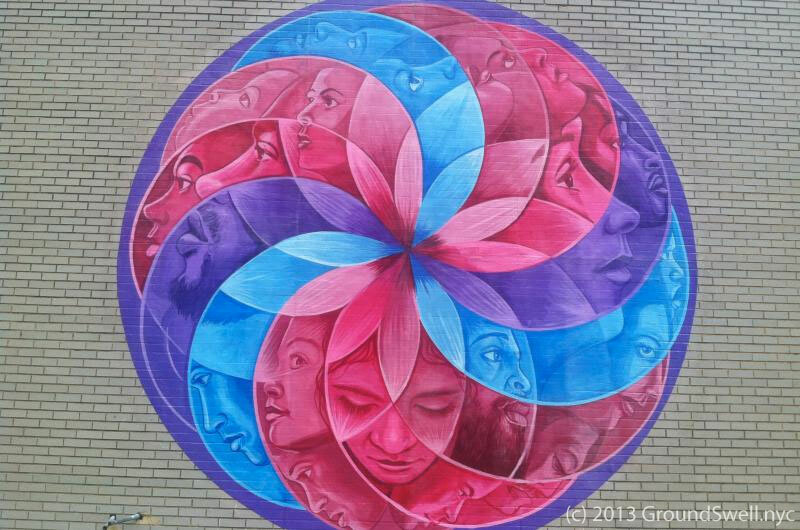 Lead by mural artist, Chris Soria, the youth of Groundswell’s Segue program painted this powerful mandala which adorns the exterior of the Brooklyn Detention Complex, in Brooklyn, NY. I love the multidimensionality of this mandala, especially the multi-color flower petals spiraling over the beautiful, overlapping faces, as they look out in all directions. In spring 2013, court-involved youth participating in Groundswell’s Segue program partnered with the New York City Department of Correction to complete a series of Tibetan mandalas for the exterior of the Brooklyn Detention Complex in Downtown Brooklyn. These mandalas complemented and extended the 2011 Groundswell mural “Justice Mandala.” During the design of the mandalas, Segue youth researched restorative justice: the act of seeking solutions that repair, reconcile, and rebuild relationships. Groundswell brings together artists, youth, and community organizations through our Scaffold Up!™ model to use art as a tool for social change, for a more just and equitable world. Our projects beautify neighborhoods, engage youth in societal and personal transformation, and give expression to ideas and perspectives that are underrepresented in the public dialogue. View more of Groundswell public art murals via their online gallery. View some of Chris’s art via the Artist-a-Day site or his squarespace page. Groundswell’s mandala inspires us to use art as a tool for social as well as personal change.